Luxury Resort Or Automotive Factory? 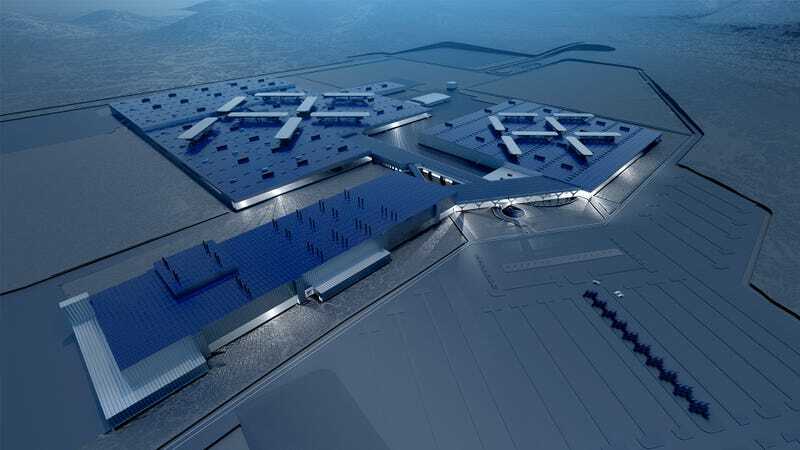 Prospective automaker Faraday Future has officially broken ground on its billion dollar Nevada factory today, revealing an updated design for the manufacturing facility that closely resembles a luxury resort with a giant “FF” logo on top. The ceremony for the new factory located in North Las Vegas was held today where the company revealed an updated design of the billion dollar facility to an audience of the press, company executives, and local politicians. Except you wouldn’t know it was an automotive factory due to the large glass walls, courtyards, and palm trees. According to the press release, the factory will feature prominent glass walls unlike any other automotive factory in the world, providing a unique openness with a user-centric approach to design. Our user-centric approach is reflected in the futuristic aspects of the building with the use of glass panels that promote a more open air concept. This is unprecedented in modern automobile factories that are conventionally hidden behind walls. The company expects to bring 4,500 new jobs to Nevada over the next ten years and, in addition, will help improve the local infrastructure. The press release claims the new facility will use geo-thermal, wind, and solar energies to provide sustainable power, and the latest, safest materials will be used in construction. You can watch the full presentation from North Las Vegas on the Faraday YouTube channel, where Nevada Governor Brian Sandoval welcomed the company home and made sure to point out how “smart, tough, and honest” the Faraday executives were to work with, applauding their integrity. So far the only reality is this factory deal and an electric supercar concept that doesn’t drive, so I look forward to seeing Faraday’s intended production car, which will be built on a modular platform and likely feature autonomous capability in a ride-sharing or ride-hailing business model. Things are on the up-swing for Faraday Future, and hopefully by the completion of construction of the new factory/resort in two years, we’ll all be eagerly awaiting production of the “next stage of the automotive industry” in whatever form it takes.